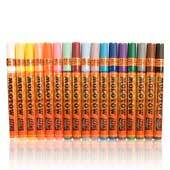 Really great marker, these shine on a Canvas, not so much paper because they mess up the paper, but on a Canvas or watercolor paper they own. Not to mention so many colors they rise over decos anyday. (apreply) I used them on paper all the time. You might be using the wrong kind. The paper does matter after all.